Renovating Your Bathroom? I've Got 5 Designer Tips That No One Else Talks About! I promise that I’ve never heard anyone talk about most of these tips that I want to share with you for your bathroom renovation. They make SUCH a difference to the final result! Our small master bathroom got a big update last year, but I haven't had a chance to show it to you until today. Actually, we had two of the bathrooms in our sweet house completely renovated over the summer, one right after the other. A little brave, but we wanted to bite the bullet and then be done. The vanity had two sinks--a really important feature in a tiny bathroom. There's also a toilet, but you don't need that picture. You know what a toilet looks like. And now - the "After:"
Same space--can you believe it? We knocked that coffin down--and discovered that the shower pan had been leaking underneath for YEARS! Talk about good timing. Now there's light, glass, white subway tile on the walls, chrome accents and beautiful recycled glass tile on the floor. The renovation was a journey (as all renovations are, right?). Good lord, look how pretty this is. I don't mean to brag, but we really do love how this looks and functions now. White Marble, acrylic pulls, pretty mirrors and that gorgeous Sea Salt interior paint color that Sherwin Williams has blessed the world with. Bathroom Renovation Tip #1 - Pay attention; no detail is too small. Did you notice this in the photo? The contractor put white quarter round molding between the floor and the cabinet toe kick. I understand why he did it--he was "matching" the base molding in the rest of the room. I didn't even think about it until everything was done. 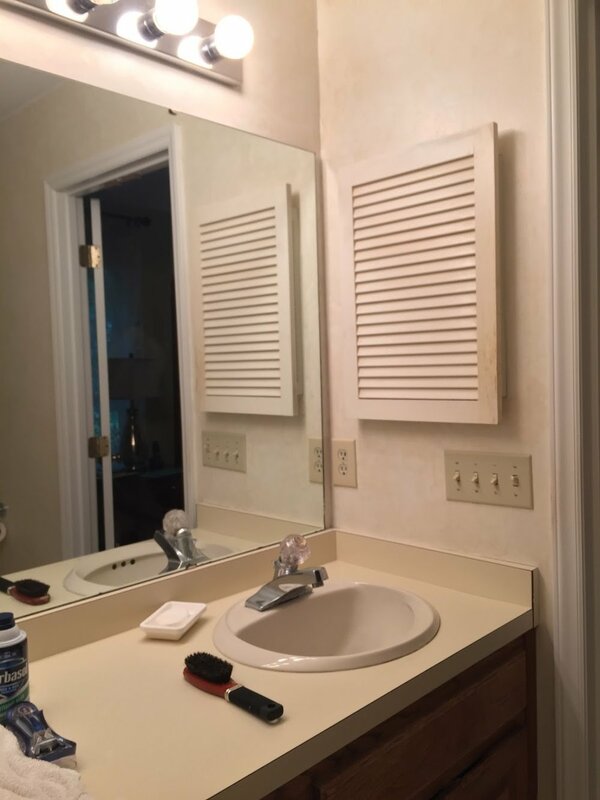 That piece of molding should have been painted to match the cabinet. I'll get around to it. Someday. In the meantime, it bugs me. First world problem. Bathroom renovation tip #2 - look at the Big Box store's online selection of pulls and knobs. These came from Home Depot. They look very similar to ones carried by Restoration Hardware, at half the price, I love them. Renovation tip #3 - pay attention to lighting. Look at the "Before" above of the light fixtures. The famous clown lights that every builder seems to adore. Since it's a small space and we were using LED bulbs in the new fixtures, we were able to remove the light inside the shower. There's glossy white subway tile in there and a recessed can outside of the shower (you can see it reflected in the mirror) along with 2 lights on each side of the sink. With all the glass, we could also taking better advantage of natural light coming through the window. Any more lighting and it would have felt like showering during an interrogation (now that's a weird thought)! Too much! Reno tip #4 (the day is long, I'm obviously conserving my characters). Choose your wall color carefully in a tiny room with light and mirrors. I LOVE Sherwin Williams Sea Salt on walls and I swear it often feels like everyone in the U.S. has Sea Salt in some room in their home. It's a well loved color and rightfully so. So soothing. But when it first went up, everything suddenly had a greenish blue cast to it. The floor, the walls, the tile. I gave it a couple of days and all was well. Some of the change was because of the LED bulbs. Incandescent bulbs give off a very warm color, so switching to the LED meant we shifted to a soft white color. In the end, soft white is a true-er color. True-er? Is that a word? Tip #5 - don't tile anything all the way to the floor. When a vacuum cleaner hits that tile, it will crack. Sigh. We'll fix that someday. Soon I'll show you the results in the other renovated bathroom, which Grandboy uses. If you have updated your bathroom in an older home lately, I'd love to hear what you learned! I've got 5 tips if you're looking to create a great finished basement that your family will use and enjoy often. We recently finished just such a project, so I thought I'd give you a quick list while it's fresh in my mind. 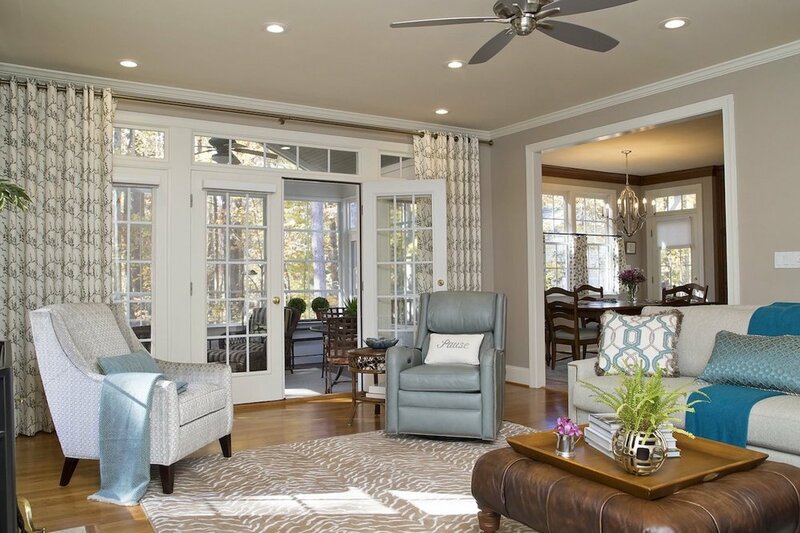 In a previous post, I showed you a room we worked on on the first floor of this home and mentioned that we created a place that really made the man of the house happy. This is it! The above photo shows you that the room already had a lot going for it: the homeowners had installed nice hardwood floors, there's a beautiful stone fireplace and this is a daylight basement. Just look at all those windows! Ok, your basement might not have such great bones to begin with, but the following tips can make any finished basement a great one. The homeowner's wanted to have a pub-like atmosphere with a family friendly vibe. We ran with that request. 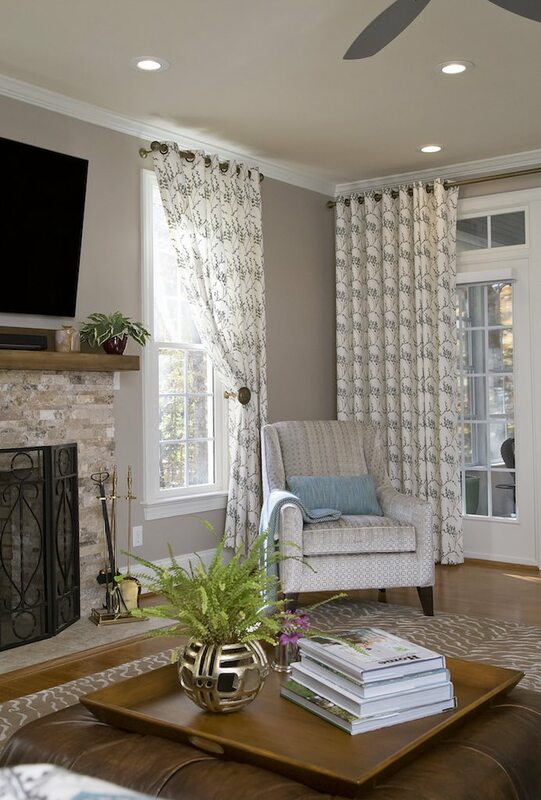 Tip #1 - a great finished basement pays attention to the windows. The windows on the fireplace wall let in a LOT of light, making it difficult to enjoy watching the game during daylight hours. We added woven blinds, covering the transoms (don't gasp, there's still plenty of light), so now TV viewing is more comfortable. The lower panes on the side windows exposed a not-so-great view of gardening supplies. We added antique stained glass windows--actually hanging those windows in the windows! This adds a colorful, pub-like design detail and completely takes the attention away from the immediate view outside. Tip #2 - a great finished basement has a realistic budget. This post talks about creating a GREAT finished basement, not a basic basement that your teenagers will head to only because it's far away from your eyes and ears. That doesn't mean you need a huge budget, but this is an investment project, and worth spending some money on. A GREAT finished basement is enjoyed by all ages and for all occasions. It's not where you throw your old furniture. You can incorporate these tips as your budget allows--they're all worth the wait. Just don't wait too long! Tip #3 - a great finished basement needs a pretty ceiling. Many basement ceilings are pretty ugly with acoustic tiles and/or dated light fixtures. Every decision you make when finishing a basement should remember that you want this room to look great. That means it's an important room and needs nice finishes. In this basement, we already had a smooth sheet rock ceiling and recessed can lighting. Adding wood beams made a big difference to the overall feeling of the space. I really do believe that line about the ceiling being the 5th wall. 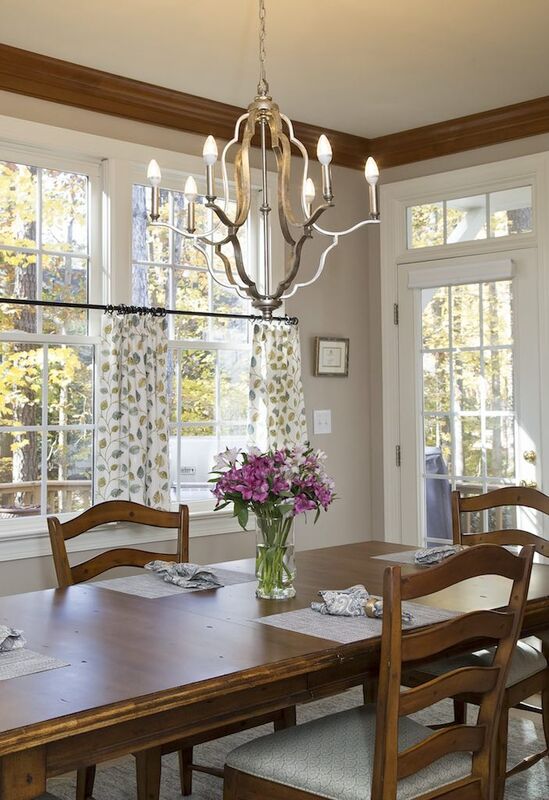 Faux beams are easy to install (by an installer/handyman) and add architectural detail. A note - because the span of each beam was very long, we added straps to cover the seams. 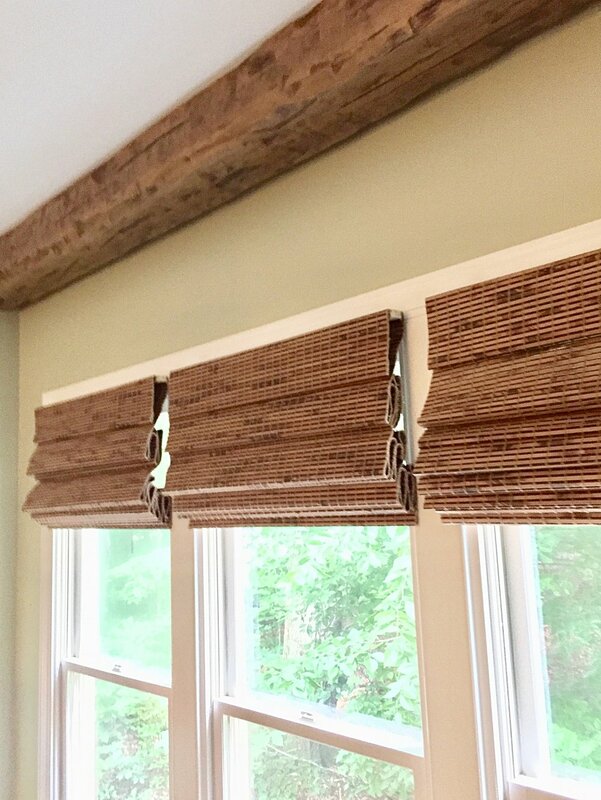 Straps cover the seams and add to the authentic look of these awesome faux beams. And we painted the ceiling a light beige, just to warm it up next to the beams. Btw, did you notice that we painted all the moldings in the room a gorgeous, rich brown? There's a lot of dark brown, black and gray in the room. Putting those colors in a room is a way of bringing the outdoors in, creates depth and adds warmth. Tip #4 - a great finished basement has the right lighting for a variety of activities. Although the room already had recessed can lighting, the cans weren't in the right places to be useful for specific tasks. We had them moved so the room is now lighter, brighter and there are no dark corners. Yes, the ceilings had to be repaired after that. Look back at Tip #2 which talks about having a realistic budget for greatness. My photos don't show a section of the room where the kitchen lies. All we did there was to add a antiqued mirrored backsplash. This added sparkle and great reflection of light from the windows across the room. I love light, don't you? We want to see what we're doing! Tip #5 - a great finished basement has zones for activities. This awesome custom cabinetry means there's a place for everything--storage is always an important element to consider in a room used by lots of people. We want to know where to look for the monopoly game, boat gear and puzzles! Where I live in North Carolina, there aren't a ton of basements. People who have them are super lucky. In the Northeast there are LOTS of them. I grew up in a house that had one and, for it's time, it was a great one. Much smaller than this one, but we had a fireplace, a pool table, a bar with a fridge and a place for the record player. This project may be on a grander scale, but the purpose and use are exactly the same. Make your basement comfortable and inviting for all ages. Don't skimp on those finishes and details. Make it a great finished basement and reap the rewards of good times with family and friends. Creating a library, sitting room AND music room: multi-function with "Wow!" Today's families aren't interested in having rooms that get used once a year to eat a turkey. Multi-function rooms are great to have - and I don't mean a guest room that also holds unfinished projects, unused furniture and the laundry before it's put away. In this post, multi-function means that the room can be used as a library, a sitting room and a music room. In a guest room scenario, it could mean that the space is also used as a place to practice yoga, do a little creative writing and bunk those lovely weekend guests. All things you would want to do on a regular basis. Sorry it's not all sharp and perfect, but this is a Before picture. 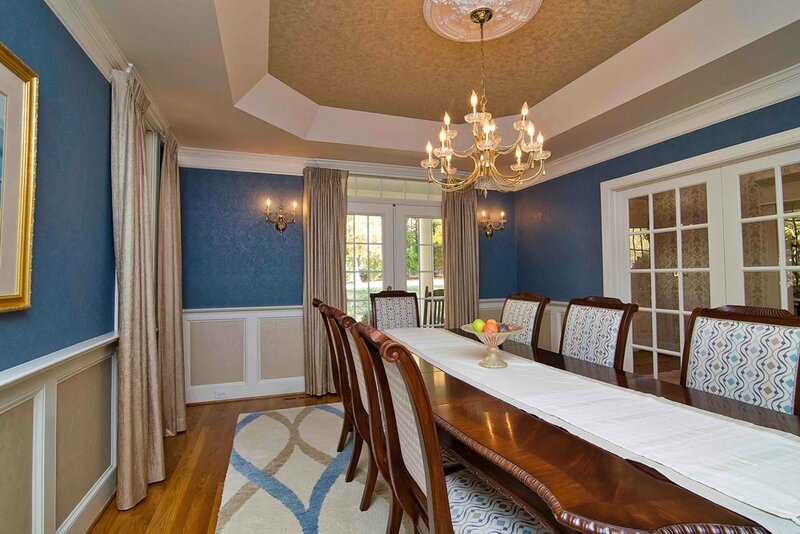 It's a beautiful Dining Room that I had a hand in a number of years ago. Now the family in this home needs to use the space differently. And they want some Wow! Decorating a room so that it's pretty to look at...as you walk by--is just not my style, and I don't think it's your style either. It sure wasn't the style of this family of five. 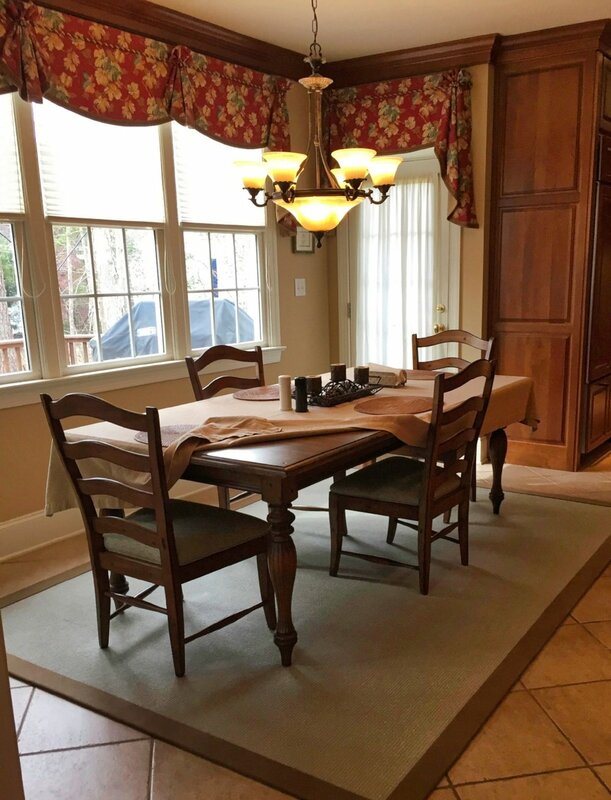 They called me with a request to change the way they use their Dining Room and asked that I add some "Wow!" to the end result. Same room. Now it's a multi-functional room they use every day. Beloved books, the piano and people are the star attractions here. It's right off the entry to the home and everyone says "Wow!" when they see it. Mission accomplished! Here's the foyer. Look carefully to see a bit of the draperies way over on the left. You can tell that it's now a dramatic, but family friendly entrance. Did I hear you say "Wow!?" Obviously the use of color was important in this transformation. The homeowners had to have some trust in me. Their favorite colors are beige and brown so I reassured them that my design concept of adding strong color on custom built-ins and wallpaper (for both walls and ceiling) wasn't going to make it a scary space, but a warm, inviting space that enhanced that multi-functional vibe they were after. They trusted and here we are. Lighting was another important element. We used classic fixtures that had some sparkle. 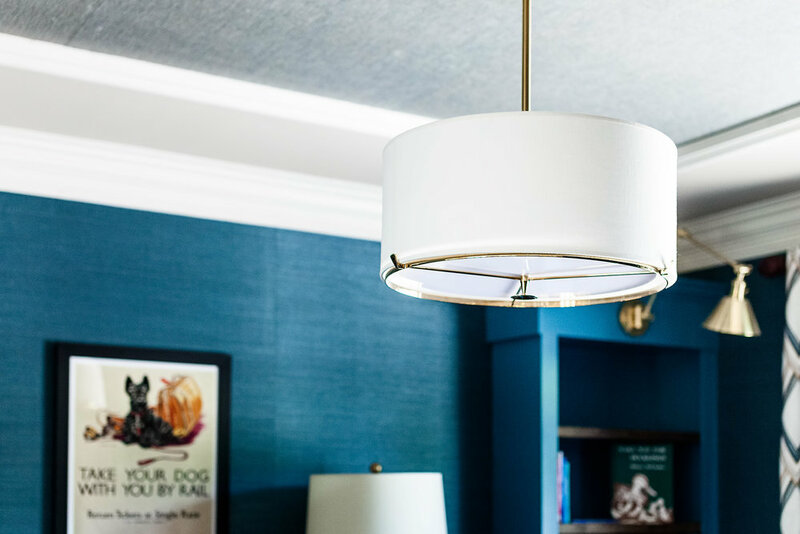 This Hudson Valley adjustable library sconce lets us highlight those fabulous shelves that will soon be filled with books. 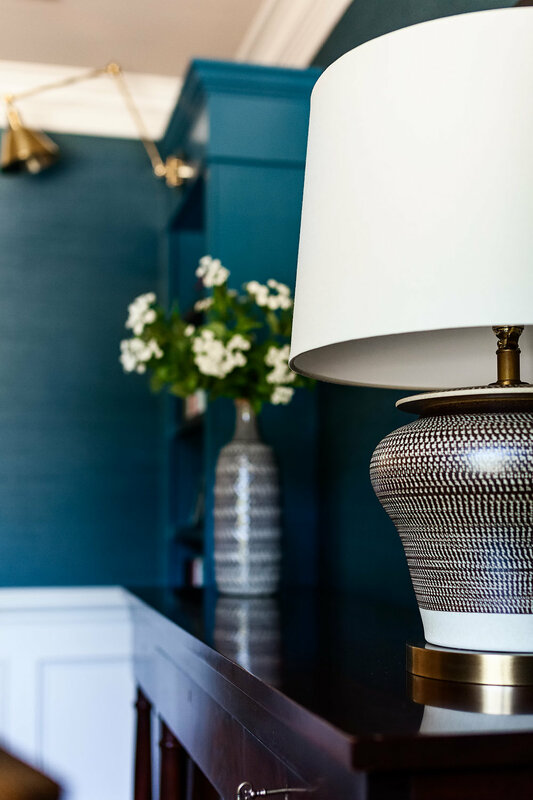 This handsome hunk of a table lamp by Currey & Co. is a wonder. A closer shot of the Robert Abbey pendant in the center of the room. Those brass details are just enough. Instead of painting every inch of the custom built-in bookshelves Peacock, I asked the carpenter to stain the shelves walnut to add a little dimension. He did a great job. And take a look at the gorgeous Robert Allen Design fabric we used on the new custom drapery panels! The pattern is embroidered on a linen blend background. ...everyone is reading and Mom has a very nice spot to relax over a bottle of wine when friends come to visit. Don't worry about Dad--I did another room in the house where the really big kids (men) like to hang out. I'll show you that one soon! A kitchen update that shows personal style and looks great! A Kitchen update doesn't have to include tearing out cabinets and replacing appliances. Let's look at this recent project. Above is the "Before" of Jody's kitchen. She wanted to make it feel fresh and a little artsy and she didn't want to rip out the wood cabinets nor take down the coppery mosaic tile backsplash. 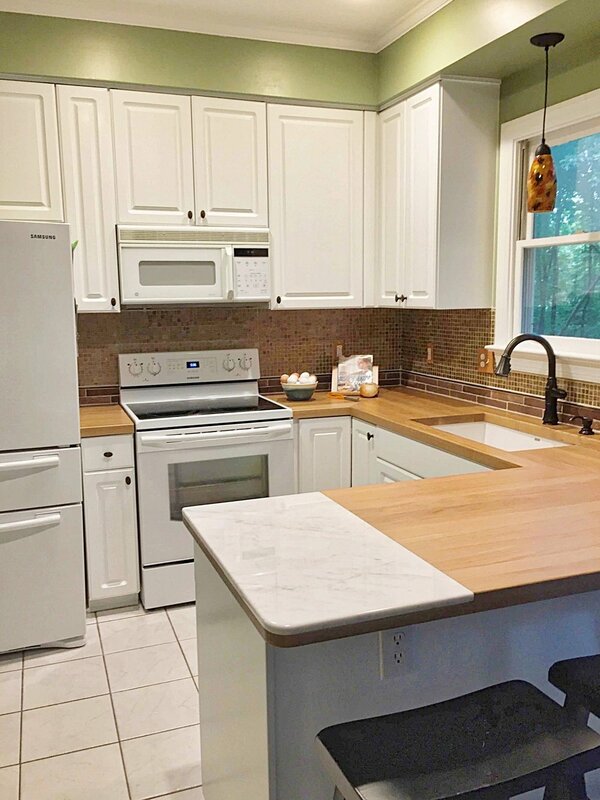 Jody does want to replace the white formica countertop with butcher block and she would love to see a piece of stone at the end of the counter. She saw that idea online and thought it was pretty cool. Her designer (that would be me) was worried that adding a detail to the end of the counter in a small kitchen would stop the eye and make it appear even smaller. Jody persisted, won me over and we got it done. Here's the "After!" Isn't the Carrera marble at the end of the counter some kind of wonderful? Jody was right! It's a cool idea! We specified White Oak counters with a clear, catalyzed conversion finish. Signature Custom Woodworking in King, North Carolina made and installed them and they're absolutely gorgeous! We removed the old formica backsplash, replacing it with very affordable brick tile (64 cents per piece!) and a not-so-affordable copper pencil tile on top to transition nicely with the older mosaic tile. A very successful transition! Another photo of the "After." Jody had the painter give the white cabinets a fresh coat after everything was in. Now this kitchen reflects her personal style which is warm, interesting and fun. We wanted to use a farmhouse sink in this project, but they weigh A LOT more than other sinks and would have required adding serious support in the existing base cabinet. Jody didn't want to lose that much storage space, so we switched gears and chose this fabulous Blanco Granit sink. It's a great choice. It doesn't have a shiny white finish like porcelain. It's faintly speckled. We took down the heavy woven woods valance over the kitchen sink and replaced the dated track light with a pretty multi-colored glass pendant that adds some nice sparkle. A new oil rubbed bronze faucet and soap dispenser add more warm tones. And isn't that sweet pig painting by local artist Ana Peralta an awesome addition to this kitchen? I'm calling him Wilbur (not very original, but it fits). Sean, our super duper handyman did the demolition work on the old counter and sink. It was his idea to router out the space for the marble piece so it could sit level with the counter. Genius! We were all very excited by that idea. Wanting to keep the artsy vibe going with splashes of color, we added this sassy little rug by Company C at the sink. Isn't this kitchen SO pretty now? Nice update, right? The kitchen table is right next to the new counters and in a lovely bay window, overlooking a spectacular back yard (think trees, flowers, fire pit, eating and grilling space). All we needed to do here was to replace the light fixture. The new fixture is by Dailey and blends oil rubbed bronze with mercury glass lamps brilliantly. Sparkle and texture baby! THEN, we moved into the next space, adding two wood beams to the ceiling and updating the ceiling fan. The world is filled with bulky old ceiling fans and I'm making it my personal duty to draw attention to them and replace them with new ones that are more modern and visually lighter! The beams are stained Fall Leaf Brown. They add so much character to a room and you would never know that they're made out of high density polystyrene! Sean has installed beams on several projects now and he says they cut like butter. He always does a fantastic job. Attention to detail makes all the difference. Not every project has a huge budget - this one probably cost less than $10,000, with the biggest chunk going to the wood counters (and worth every penny). 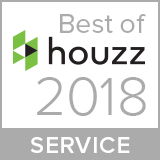 However, every project has a homeowner with a personality and a desire to create a beautiful home that makes walking in the door at the end of the day a pleasure. Jody didn't want a space like everyone else has. She wanted to update her kitchen and end up with a space that looks like Jody lives there. Now we're moving on to the front of the house to make some changes there. I'll show you what we do when it's done! How About Some Color On Those Interior Doors? I've always wondered why most interior doors are painted white. Maybe because they match the trim color, or because it's easy on the eyes (nothing going on here! ), or because by the time we looked at the doors we were tired of choosing colors. I'd like to suggest that some of your doors should be painted or stained to look different than the others. 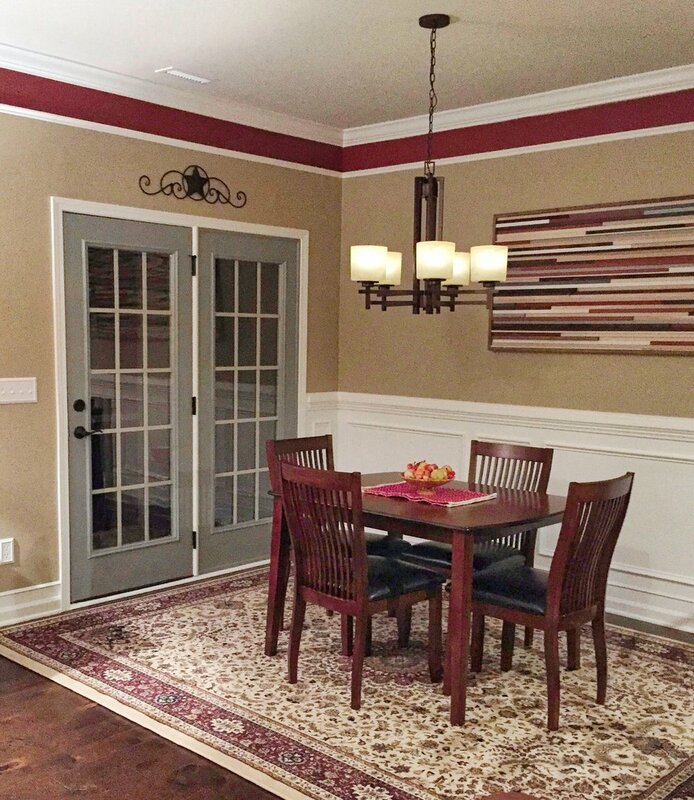 Benjamin Moore's Heritage Red (HC-181), high gloss paint makes sliding open the pantry door a real treat! And can you see the natural hickory door next to the white back entry door? All the doors aren't the same, even in this tiny space! I recommended Sherwin Williams Tin Lizzie (SW 9163) in a semi gloss finish for these french doors. My client painted them himself and did a fantastic job! He kept the door moldings a bright white. Want to see another one? 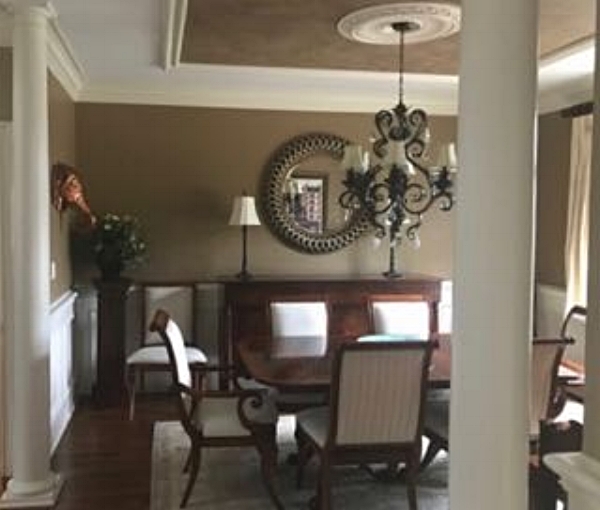 I chose Benjamin Moore's Amherst Gray (HC167) for this client. They painted the door molding the same color. There are two other doors in the room that I don't have photos of. One is this color and the other a much darker faux finish. They all tie into the french country vibe of the space so well. Ignore the spirit in the glass. She's a friendly ghost. As soon as it's warm enough (it's winter as I write this), I'm going to paint the door to our garage a pretty color--maybe a dark green, like a pond scum green. I always like that color in paintings, go figure. It's called "home on the range." How perfect is that? Benjamin Moore #483. I'll show you when it's done! 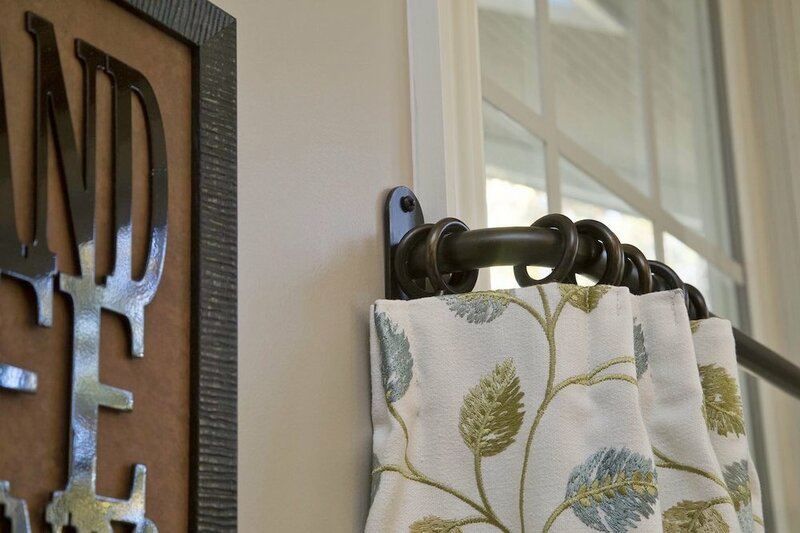 Do you have a fabulous color on any of the interior doors in your home? I sure would love to hear about them if you do!